Happy Monday guys, I thought I would share what I've applied onto my face today, today is a stay at home Monday but I did want to look put together and not constantly touch my face when I have no makeup on. I'm an either an all or nothing type of girl and this look is so simple for that quick errand run or I don't want to scare the postman look. 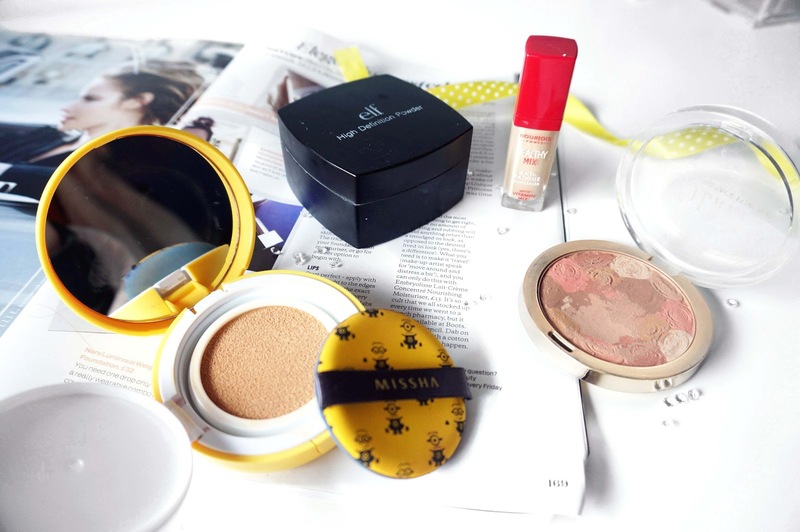 I apply my skincare as normal and today I opted for the Missha Magic Cushion Cover as my base, using the sponge applicator provided, it gives me a natural finish with good coverage hiding my pigmentation and redness. 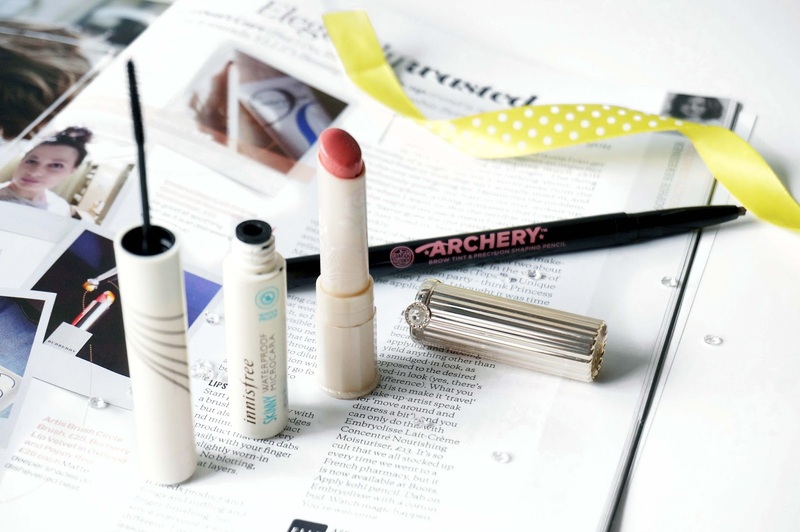 It has a buildable formula and is easy to work with. The shade #23 is perfect for my pale skin tone right now and I've done a whole detailed review of the Missha Cushion here so don't forget to check that out. For concealer today I opted for a lightweight concealer which helps brighten my under eyes. I have been loving the Bourjois Healthy Mix Concealer which combats tired looking eyes, it also has a buildable formula and many skin benefits. I also use this to shape my brows. This lasts on me all day especially when I set it with a powder. 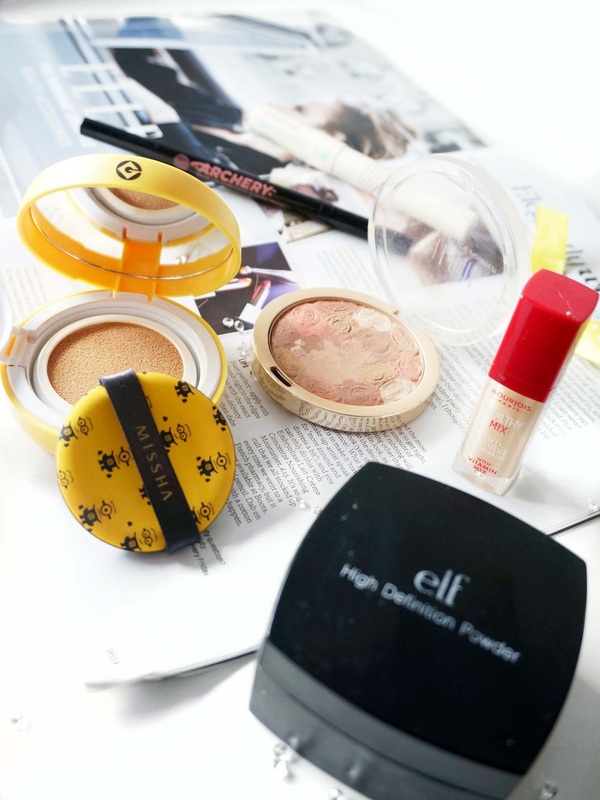 The face powder that I have been using for months is the RCMA No Colour Powder which I poured into an empty ELF container, it makes it so much easier to grab the product and set my face. This is truly translucent and does an amazing job of setting your concealer and foundation. For bronzer/blush, I always use my trusty Milani Illuminating Face Powder in the shade Amber Nectar, this has the perfect slighted brown tone that helps bronze up your skin and adds some colour to your cheeks, this is one of my all time favourites that I use all year around. For my brows, I have missed using the Soap and Glory Archery which has a felt tip end and a brow pencil. This Brownie Points shade which helps fill in my sparse brows, the felt tip end can mimic hair like strokes and is simple and easy to work with. For my lashes I opted for the Innisfree Waterproof Skinny Mascara, it grabs every single lash and works wonders on my tiny bottom lashes. I like to let the first layer dry and then apply another layer, it really helps lengthen my lashes which are all I want in a simple makeup look. 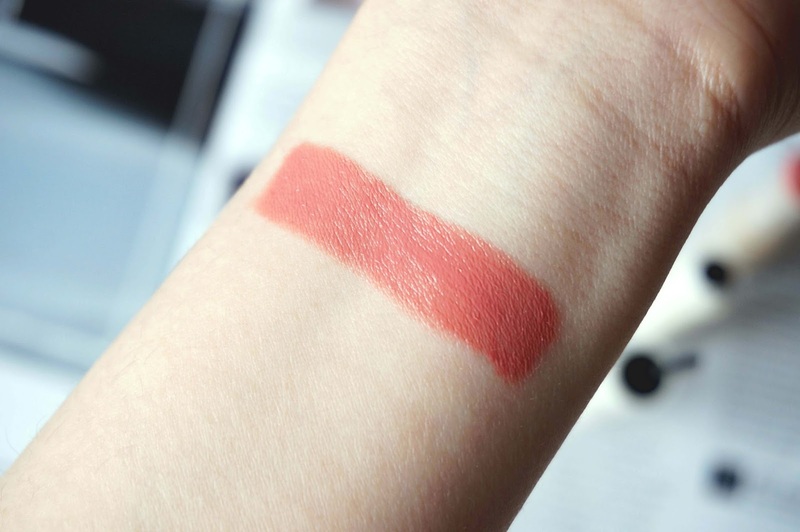 For my lips, I really need to get away from all my matte lips and I did not want to apply a gloss either, I opted for a satin creme lipstick from Canmake #403B which is a beautiful pink coral colour, it really hydrates my lips and the colour brightens up my whole complexion. 7 products are minimal of all minimal I can go down too, you should really see what I wear on a day to day basis. This overall look took me 10 minutes. When I put on makeup I feel more out together even on my lazy days. Hope you've had a good day so far! You really can't go wrong with Soap & Glory brow products, I love the original Brow Archery, it's a great dupe for Anastasia! 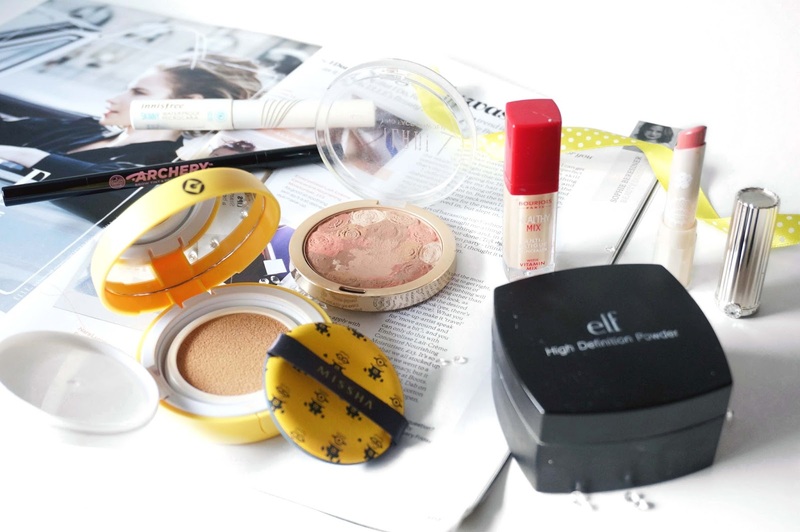 Thanks for sharing your simpler makeup look! I've been playing around with a lot of different techniques and have been wearing more than usual but I need a break and want to get back to basics. Love seeing the products you used! I hadn't heard about most of these products! Thanks for sharing! This is such a great look! I have the same Milani powder you mentioned in the post, though I haven't worn it much. I need to get around to using it more! I'm the opposite with brow products - I prefer using a pomade because it takes me all of a minute to do my brows, while pencil-types just take too long and makes my brows look unnatural! I need to hunt down a cruelty-free thin mascara for my bottom lashes, but it's just so hard!